I have a big website with some forms. 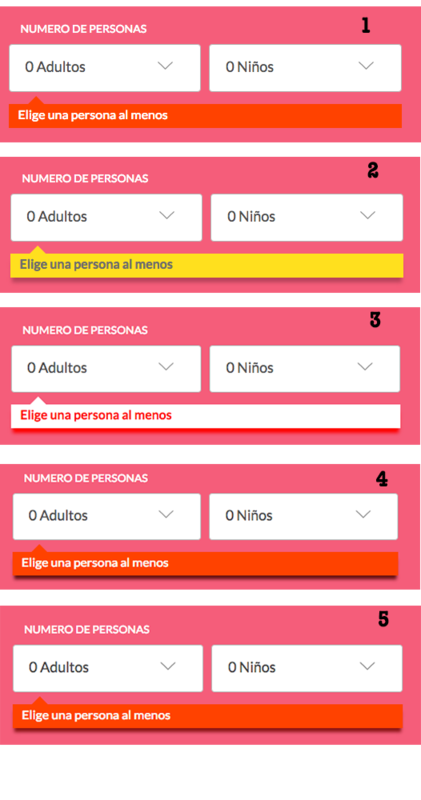 There are four background-colours for the form components. One of them is pink/red. I can't change the form background-color, but I'm free to change the message style (background-color, text-color, etc.). What do you think? I don't like it the red with white text. The error message is not very visible, because the background is red. I've been trying for a few days with other red styles, and some oranges, but it looks weird. How can I improve this form? I mean, I should change the error message and don't touch the select components. Thanks you all for the feedback!! I'd go with a color that'll always retain stark contrast. I'd also avoid venturing too far outside of the styles that that users are generally familiar with. 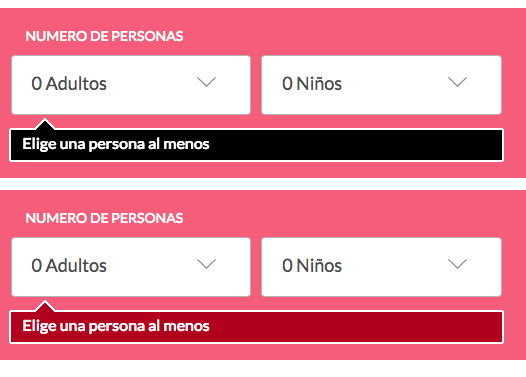 Because you're working in an atypical style, if you deviate and use unfamiliar elements you may risk confusing a percentage of your users. Here's what i think i'd recommend. I would go with something in the shade of the background, but have a more red text in the alert. You can add a border in the shade of the text to make it stand out as an error more, as well. A bright yellow background with black text would work well. Fits the colour scheme of a warning sign. One important point to understand is that using conventional colors for errors is important because they make the errors more noticeable. 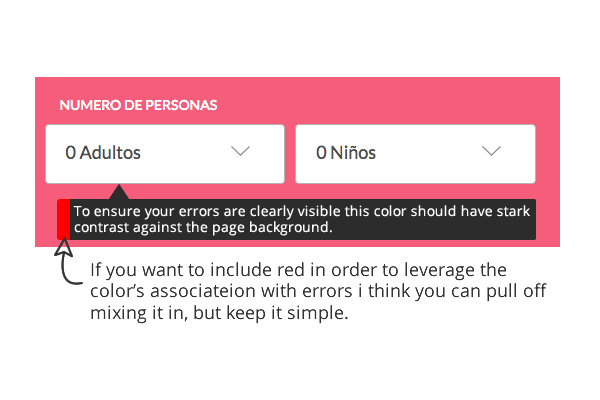 User being annoyed by the color of error message is lot less of a problem than user not being able to complete the form because they didn't notice the error. At least in most cases. Since red will be lost in your background, the next best thing is to use yellow with a red error symbol. The yellow attracts attention and also has a very good contrast with the background. The red error symbol conveys to the user that this is an error message, since this is a well accepted standard symbol. You might try adding a white border, then play with the background color. The one color that communicates 'something is wrong' louder than red is the color of death, black. Try reversing your error message styles: Red text on a white background. Never only rely on color. Adding an icon or text or texture not only helps colorblind people, but also makes things a bit easier for regular-seeing people. Using a dark grey or black bar gives a strong contrast with the background. It's also color neutral so you can put other kinds/colors of notifications in those boxes. Using an orange or yellow instead of red avoids looking too close to the background. And it still has useful connotation from warning signs. Find a complementary colour to use that will stand out - there are plenty of tools for this, and you can also consult the branding guidelines as a secondary check; this could be for the UI, the font colour or a combination of both. Apply an interaction or behavioural pattern - this one is different from the rest as it is not about visual styling but behavioural or pattern design, so an example would be an animation for the message component that lasts a little bit longer so it is easier to notice, or create a persistent component that the user has to close, etc. Not the answer you're looking for? 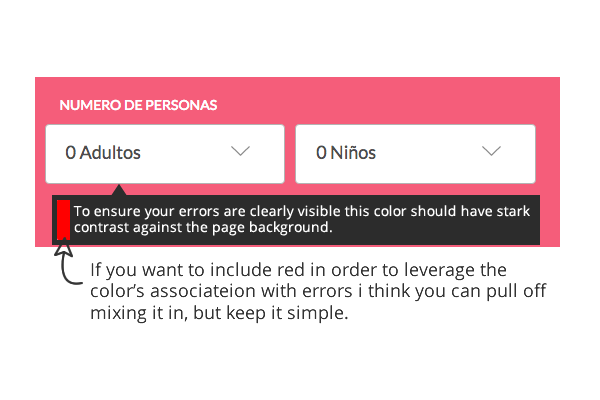 Browse other questions tagged usability forms color web error-message or ask your own question. Is it okay to use orange color for buttons and red for warning messages/buttons?